1. 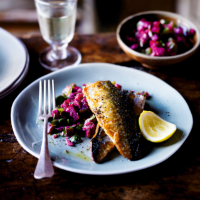 Stir together all of the ingredients except the mackerel, butter and sunflower oil. Cover and set aside. 2. To cook the mackerel, warm a non-stick pan containing the butter and sunflower oil. Season the mackerel fillets, then fry in 2 batches over a medium to high heat for around 3 minutes on each side. The skin should become beautiful and crispy. 3. Serve the mackerel dressed with the salsa and a green salad.